Legislators are working diligently in order to bring legal Illinois sports betting into fruition. Loads of residents in the state love betting on their favorite Chicago sports teams and there is nothing better than watching your team win and winning a little extra on the side. Illinois is known to be a pro-gambling state as they have legalized many forms of gambling in the state and sports gambling will soon be the next hobby added on to that list. Laws are constantly changing, both on the state and federal level, and it is difficult to follow the changes and know your rights in the betting industry. That’s where LegalSportsBetting.com comes in as we have compiled a guide to ensure you are fully knowledgeable of all aspects of the industry from laws as well as current locations you can engage in the hobby. After perusing the information, you will have no fear to place wagers on your favorite sports team (or against your most-hated rival) and know exactly what you should be looking for. Our goal is to make sure you are confident and comfortable in moving forward and laying your money down. Is Land-Based Sports Betting Legal In Illinois? A Federal law known as PASPA prevented any state from having land-based sportsbooks with the exception of a few; however, in 2018, this was overturned and states have been working on their own laws and regulations for sports wagering. The state in the process of adapting to the industry as they currently have no legal sports betting locations in the state. Previous legislative bills noted the legislators wanted to bring the industry into the state and allow for wagering in various locations such as casinos and racetracks. These would be the first land-based locations as the infrastructure and oversight methods are already in place. Just like the land-based aspect, there are no set standards and regulations for an Illinois online sports betting system. There were no discussions of bringing an online platform; however, they were discussing the outlook before PASPA was overturned. As more states are legalizing sports gambling, only a few have offered an online betting platform but those who have as taking full advantage of it. Illinois legislators have taken note and it is likely it will be drafted or added to future discussions. Just because the rules are not in place for legal Illinois sports betting doesn’t mean there are not any options to participate in playing the odds. The options are limited at the current moment but you can find legal sports betting in Illinois by using an offshore sportsbook. These operators are outside of US jurisdiction making it easy to transfer money, find a favorable betting line, and receive your winnings. Just be sure to use a licensed bookmaker that is regulated by their home country as unlicensed operators have no oversight. We recommend using 5Dimes.eu, Bovada.lv, SportsBetting.ag, and BetOnline.ag as they have years of trustworthiness, reliability, and exceptional customer service. They are all also free and provide new and existing member promotions where you can early free play for doing nothing more than making a deposit. As we mentioned these sports betting sites are definitely the most convenient and provide thousands of wagers every day in sports all over the world. There is no shortage in what these operators offer and all provide excellent customer to keep you in the loop. If you have a strong cryptocurrency wallet, check out BetOnline.ag or SportsBetting.ag as they accept more crypto than any of the other sites and can even return your winnings in this method. If you’re a beginner and only looking to wager a little bit, check out 5Dimes.eu as they offer the lowest minimums around at $0.50 per sports wager. Of course, Bovada.lv is probably the site you have heard of the most and it is known for its user-friendly platform, reliability, and trustworthiness. Illinois isn’t technically considered a pro-gambling state but it certainly isn’t opposed to gambling as there are options everywhere. The state requires casinos to be located near flowing bodies of water with the exception of Lake Michigan unless the county population exceeds 3 million people. The betting age is set at 18 for everything except casino-style gaming. Charitable gaming, pari-mutuel wagering on horses, and class-III gaming are all allowed within the state and have a regulatory body, the Illinois Gaming Board, that oversee all gambling activities. They will likely regulate sports gambling when it makes its way to the state. Sports betting laws still prevent the industry from coming there but legislators are feeling pressured to change this. Current laws make it illegal to participate in underground gambling where dealing with an unlicensed bookie is a serious crime. Not only are you putting yourself at risk in a legal sense but you also are at risk of losing your money or not being paid your winnings without any support to help you. Be sure to stick with an offshore online operator in the meantime as their security and reliability are much better than anything you will find in the state. 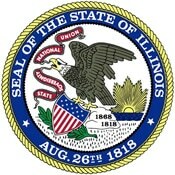 More information about gambling laws can be found in the Illinois Compiled Statutes §720 5/28-1. Illinois is home to many professional sports teams as the city of Chicago represent seven professional teams. Moreover, universities flood the state which represent the NCAA at the Division-1 level and supported by fans all over the country. Sports runs strong in the state as residents are fans of many teams and like to support the local ones. Remember that online sportsbooks offer thousands of lines every day from sports and teams all over the world, so you are only able to wager on teams from Illinois. Understood that the Illinois mentality is to root for the Chicago teams or against their rivals. Horse racing betting in Illinois is a thriving industry and legal throughout the state. The state boasts over two dozen pari-mutuel wagering facilities where horse races are simulcast for all to enjoy. Two of the horse tracks are located outside of Chicago, the Hawthorn Race Course and Arlington Park, which are easily accessible for residents in the suburbs. The other track, Fairmont Park, is located in Collinsville which is across the Mississippi River from St. Louis. While horseracing season is limited to seasonal months, that doesn’t have to stop you from betting on horses as the online operators we listed above are also racebooks and offer betting lines on events all around the world. Illinois daily fantasy sports (DFS) is an interesting topic as the state allows for operators and players to participate; however, the Attorney General gave an unfavorable opinion on the matter. Regardless, DFS operators like FanDuel and DraftKings are able to be played and offer prizes ranging from a few cents to a few hundred thousand dollars. Some contests are free to join and they both provide sign-up and friend referral bonuses. Put together a lineup of athletes under a certain salary cap and see yourself winning prizes and potentially a trip to the DFS Championship. Can I Bet Real Money On Sports In Illinois? Real money can definitely be used to gamble on sports in Illinois. The operators that we listed all accept a myriad of deposit methods such as Bitcoin, credit card transactions and more. They have even more methods to withdraw your winning like wire transfers and checks by courier. When land-based sportsbooks become legal in Illinois, you will also be able to use cash at their cashier locations. Online sports betting in Illinois is safe provided you use the standard set forth for finding a sportsbook. Make sure they are licensed, regulated, and located offshore as these operators are trustworthy and use data encryption when you make a deposit so your information is secure. Also, they are located offshore which means they are outside of the jurisdiction of federal and state laws. Will Sports Betting In Illinois Ever Be Legal? Sports betting in Illinois will likely be legal very soon. The state has been heavily discussing bringing the industry to the Prairie State. Since the overturning of PASPA, Illinois legislators have been focused on making sure every aspect and regulation is clearly laid out so they only have to go through the deliberation process once. They realize the tax benefits and don’t want to be behind on the trend as they watch neighboring states introduce a regulated industry before them. Will I Get Arrested For Sports Betting In Illinois? You can get arrested for sports betting in Illinois provided you go through an unlicensed bookmaker. These underground operators are quick to take your money and have high promises for you; however, they are unsafe and unreliable. Criminal charges can find you for participating in illegal gambling which can range in punishment so be sure to stick with an offshore licensed sportsbook as they are reliable and trustworthy. What Is the Sports Betting Age In Illinois? Illinois posts a betting age of 18 for pari-mutuel wagering and all other gaming in the state with the exception of casino gaming. Like sports betting, this requires an age of 21 and the state takes their underage gambling policies very seriously. Using an offshore sportsbook will allow you to join when you are 18; however, we recommend waiting until you are 21 as penalties can still arise for underage gambling. Moreover, the site can confiscate your funds and banish you from their sportsbook forever. Are There Mobile Sports Betting Apps Available In Illinois? State-run mobile apps do not exist yet as there is not an online betting platform in Illinois. However, the operators we have listed in this guide all have mobile betting apps that are accessible through their mobile webpage or an app download. They are just as secure as the websites and even offer live in-play betting where your payouts can be prosperous in you hit it at the right moment. Where Is The Best Place To Bet On Sports In Illinois? The best place for betting on sports in Illinois is with an offshore operator as this is the only legal way of doing so. They offer more betting lines and bonuses than land-based casinos could even dream of as they have limited overhead to pay for. Also, with online gambling, you have the ability to shop lines where you determine the best payout as no two sportsbooks are created equal. Between the four offshore operators we recommend, they all offer slightly different features so check out their websites and see which one is best for your needs. Should I Use A Local Bookie In Illinois? It is highly recommended to never use a local bookie as underground gambling with an unlicensed bookie is very unsafe. Not only is it illegal for both you and the operator, but you have no guarantee that the bookie will pay out as they have no regulatory body overseeing them. Stick with the offshore sites are they have proven to be reliable offer more than any underground bookmaker could. Do Any Casinos In Illinois Have Sports Betting? No casinos currently have sports betting in Illinois but this is likely to change very soon. We could the industry start the racetracks or at the casinos but the casinos are in areas where people like to visit and have well-established customers. You will have to rely on an offshore operator in the meantime but it shouldn’t be long before legal Illinois sports betting takes off and offers many options for your liking. Can I Bet On Sports With My Friends In Illinois? Social gambling is another interesting topic as it is unlikely any legal or criminal situation will arise from doing so but it is listed as an unapproved method of gambling. If you want to wager with friends, do so behind closed doors and keep it off the internet as you never know when a law enforcement officer will finally decide to bust somebody for laying a few bucks down. We are not lawyers and to be safe, we recommend using an offshore site instead of creating a situation in-state.